"Your beauty should not come from outward adornment, such as elaborate hairstyles and the wearing of gold jewelry or fine clothes. Rather, it should be that of your inner self, the unfading beauty of a gentle and quiet spirit which is of great worth in God's sight." Inner beauty is a powerful thing - it doesn't fade with time and it doesn't cost the earth. You don't need any nips nor tucks and there's definitely no pill you can take to achieve it. "God does not view things the way men do. People look on the outward appearance, but The Lord looks at the heart"
But God doesn't leave us wondering what a beautiful heart looks like - he tells us throughout the Bible. His desire to have a personal relationship with us shows us that he thinks we're beautiful. God thinks you are flawless. God created you in His image and He loves every little thing about you. He knows how many hairs are on your head and He loves you despite any flaws you may think you have. Even if you're not seeking Him as much as you should or you let life get in the way of your time with Him, he deeply loves you. God looks deep into your heart and calls you beautiful. He doesn't look at your supermodel legs or your flawless face, he doesn't care about perfect hair or on-trend nails or the definition on your stomach - he looks at your HEART. So next time you look in the mirror, I want you to think what God is thinking about you. Tell yourself; I am beautiful. God chose these eyes and lips, the hairs on my head, the angle of my nose and the curve of my hips. I am made perfectly because He is perfect - God doesn't make junk! 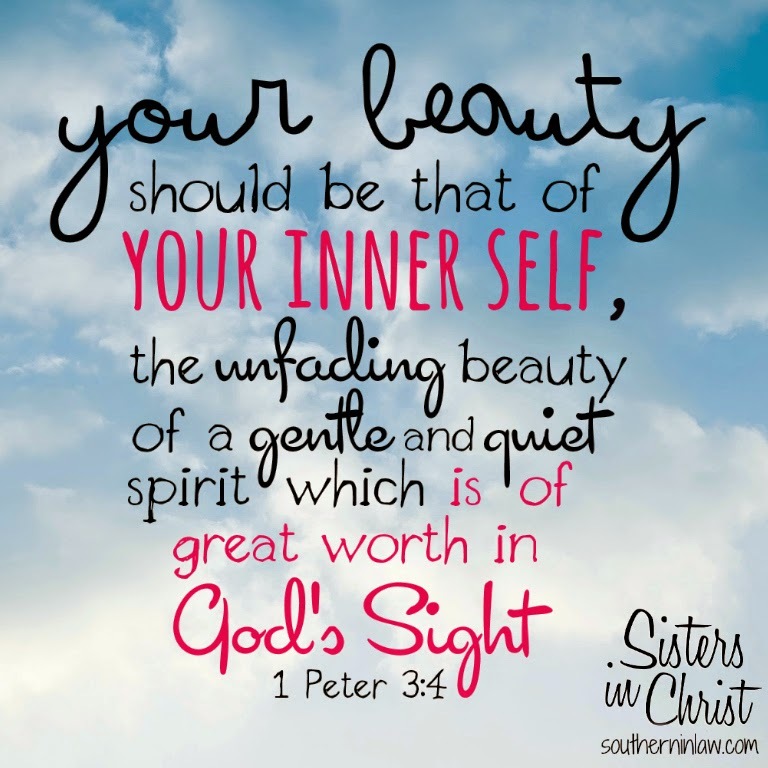 But that said, remember that nothing about a person's outward appearance impresses God, God looks at our inner beauty -the beauty of our hearts. 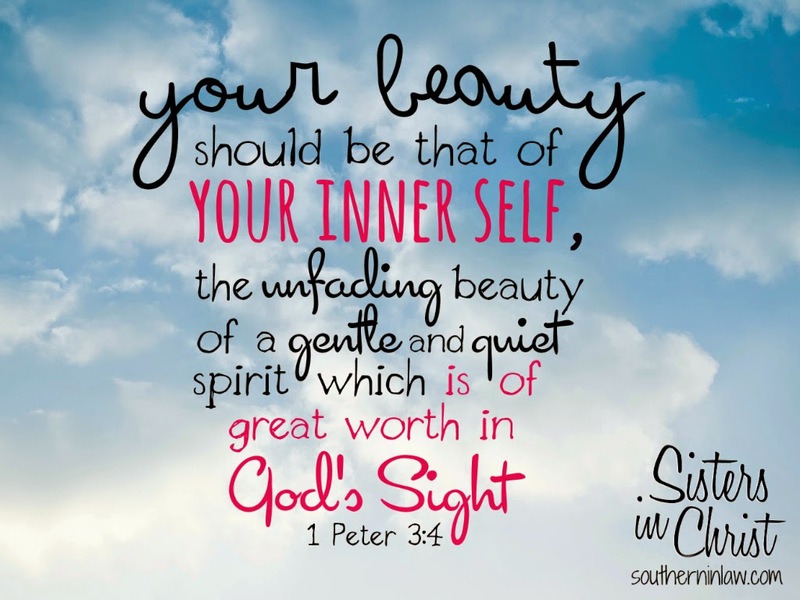 So what is spiritual beauty and how can we try to achieve it? Just like we need to exercise to stay in shape, we need to exercise our faith in order to stay in spiritual shape. 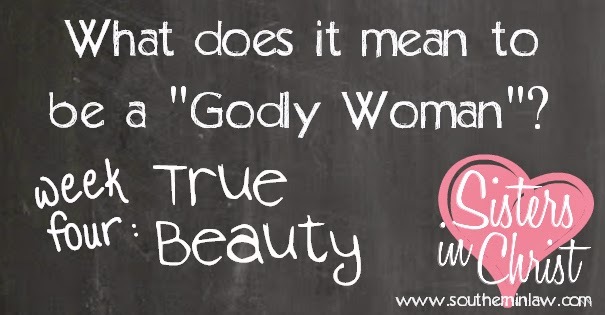 Spiritual beauty is all about living as a Godly Woman - it means spending time in God's Word, speaking to Him through prayer, going to church (so that we can be supported by our Christian brothers and sisters and serve Him in different ways). It's about having a personal, intimate relationship with Our Heavenly Father - because that is only the you'll begin to see that everything falls into place from there! yes a great reminder kristy. and robin, I recently attended a talk by a Christian woman about 'Terrific Toddlers'. It was fabulous and I really recommend her books which in particular talk about how we can practically teach and encourage our little ones to develop virtues like Kristy mentioned in this post. You can buy the books online at http://www.terrifictoddlers.com.au/TerrificToddlers/Welcome.html. Terrific Toddlers and Terrific Toddler 2. Really good! Those books seem to be a huge hit!
" God doesn't make junk "
I know, right?! Anytime I'm feeling down, I remind myself that I was created in His image and He loves me more than I could ever fathom!